We Have a Winner for MPP’s 2018 Shirt Design Contest! – Cannabistical: of or concerning cannabis. 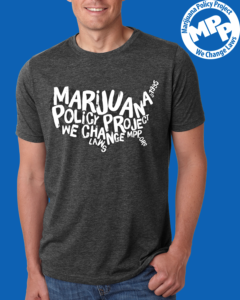 Home » Design Contest » General » Marijuana » marijuana news » National Cannabis Festival » news about marijuana » online shop » t-shirt » We Have a Winner for MPP’s 2018 Shirt Design Contest! After two rounds of voting by thousands of our supporters across the U.S.A. — beginning with a public vote on Facebook before moving on to a members-only vote —we are excited to announce the winner of the Marijuana Policy Project’s 2018 T-shirt Design Contest. Congratulations to Michelle Geiger of Apollo Beach, Florida! Her polished and imaginative design features our organization’s full name, our motto We Change Laws, our website URL (mpp.org), and our inaugural year all cleverly shaped to represent MPP’s nationwide impact. We look forward to using this new shirt to help amplify our advocacy and educational efforts on the state and federal levels, starting with its unveiling at the National Cannabis Festival on April 21, 2018 in Washington, D.C. It will also be available in multiple color and size variations on our online shop this summer. Thanks to everyone who participated in MPP’s 2018 Design Contest and for your ongoing commitment to MPP’s mission. Between the integral role MPP played in passing adult-use marijuana legalization in Vermont and our successful efforts to secure state medical marijuana protections in Congress, we have already made significant progress this year. With upcoming ballot initiatives in Utah (medical marijuana), Michigan (adult-use), and other states this year, your continued support is crucial. The post We Have a Winner for MPP’s 2018 Shirt Design Contest! appeared first on MPP Blog.